Thousands of hospital staff have received flu jabs within two weeks of the launch of special vaccination clinics to protect patients this winter. Hull University Teaching Hospitals NHS Trust launched the clinics and a team of volunteer vaccinators is working round the clock across departments to encourage staff to take up the offer of flu jabs, ensuring maximum protection for themselves, patients and their families this winter. Vaccinators trained in delivering the jab are working in different departments at Hull Royal Infirmary and Castle Hill Hospital to vaccinate staff who would struggle to leave their posts. And within two weeks, more than 3,000 people, more than a quarter of the trust’s 8,000-plus workforce, have answered the call to get their jabs before the end of November. Chief medical officer Kevin Phillips said: “We want our staff to be protected against potential infection so they can help ensure we can deliver care to our patients in sufficient numbers over the winter. “Frontline staff are at a high risk of catching any viral infection and that means they are at a high risk of spreading it to other areas or to their families. Flu vaccinations are considered vital for health staff, particularly this winter after Australia and New Zealand were gripped by the worst outbreak in years, with 170,000 cases recorded. The trust, which runs Hull Royal Infirmary, Castle Hill Hospital and Hull Women and Children’s Hospital, is offering free flu clinics to employees as part of a national campaign to vaccinate NHS staff. 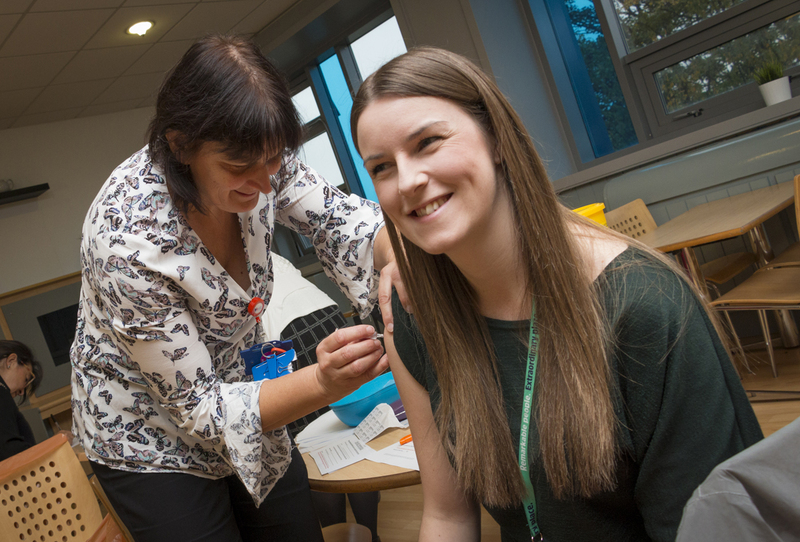 All staff receiving vaccinations between now and the end of November will qualify for an extra day off as part of a trust incentive scheme to ensure as many staff as possible get their jabs. Hull University Teaching Hospitals NHS Trust Trust has been one of the country’s best performing NHS trusts in terms of staff vaccination rates for the past five years. Last year, 78 per cent of frontline staff were vaccinated against flu. The phenomenal response in the first two weeks suggests Hull could be on track for a record-breaking vaccination rate. People in good health who catch flu are usually expected to recover within a week or so of contracting the illness. At-risk groups are also more likely to develop potentially serious complications such as pneumonia. Trust head of occupational health services Carole Hunter said: “We think the publicity about the outbreak in Australia has made people realise the importance of getting their flu jab this year. “We’ve also introduced new ways of allowing people to receive their vaccinations. As well as clinics in departments and in the hospital dining rooms, we’ve got volunteer vaccinators who are going to staff working across the trust so they don’t even have to leave their posts.